Many thanks to Graeme Cruickshank who gave me details of the 1869 – 1870 entry below which tied in and confirmed that William Wilson & Son was the same William Wilson who operated out of the Campbellfield brick works and pottery. William Wilson, Brick and Tile Maker, Campbellfield, Glasgow. 1825 – William Wilson, Brick and Tile Maker, Campbell Fields, Glasgow. 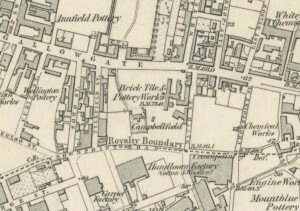 1840 – 1841 – Wilson, William, brick and tile maker, builder and potter, 706 Gallowgate, ho. Campbellfield. Orders left at J. & E. Reid’s, 41 Argyll St.
1841 – 1842 – Wilson, William, brick and tile maker, builder and potter, 706 Gallowgate, ho. Campbellfield. Orders left at J. & E. Reid’s, 41 Argyll St.
1843 – 1844 – William Wilson, Patent brick and tile maker, builder and potter, 706 Gallowgate, and Cavendish Street, Laurieston House, Campbellfield. of Walter Wilson, Writer in Glasgow, designed in his Petition of Sequestration, Merchant, residing in Glasgow, formerly a Partner of the late Firm of Wilson and Leighton, Factors and Writers there, for recall of the sequestration of the estates of the said Walter Wilson. Of Petition for Recall, Lord Fullerton, Ordinary, on the 19th October current, ordered intimation and answers within eight days, and the intimation to be published in the Edinburgh Gazette, in terms of the Statute. Horne and Rose, W. S. Agents for Petitioner. Edinburgh, October 20,1848. 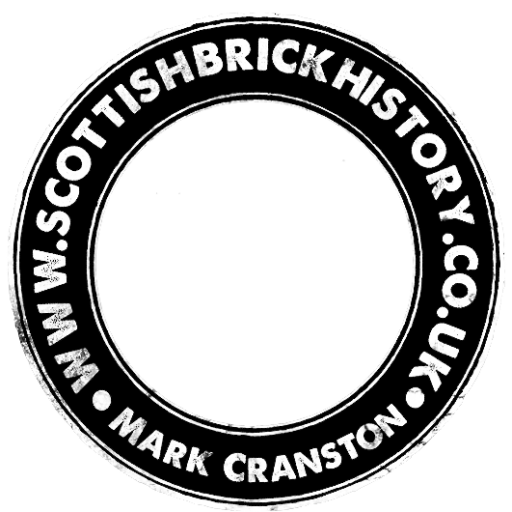 28/07/1849 – Glasgow Gazette -Scotch Bankrupt – William Wilson of Campbellfield (Campbellfield) brick and tile maker in Glasgow – Creditors to meet 6th and 27th August in Comries Royal Hotel, Queen street at noon. 14/05/1850 – Greenock Advertiser – The lands of Campbellfield, six scotch acres with dwelling house, brick work etc situated near to Gallowgate Toll, ground annual £28 15s – sold at the upset price of £3500. ( This appears to have been sold privately prior to the scheduled auction date of 24/04/1850 as per the newspaper article above dated 12/04/1850). 26/09/1850 – Caledonian Mercury – Wm Campbellfield, brick and tile maker in Glasgow has applied for a discharge. 23/10/1851 – Perthshire Advertiser – States of affairs – of William Wilson of Campbellfield, Brick and Tile Maker, Glasgow lie with Cunninghame Borthwick, Accountants, Glasgow. 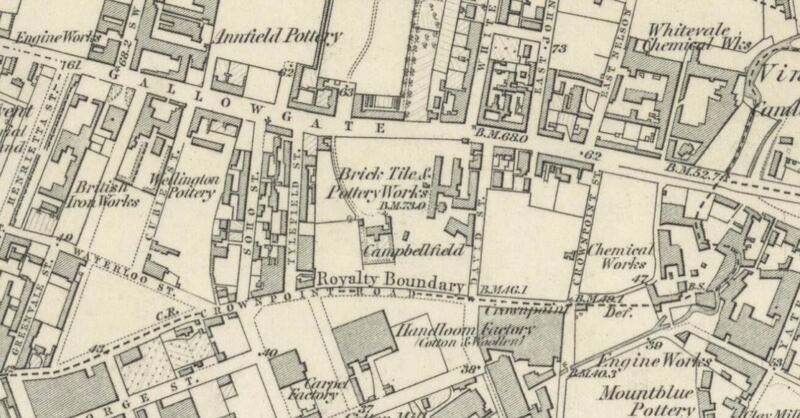 Below – 1858 – Campbellfield Brick Tile and Pottery Works Glasgow. 14/07/1862 – Edinburgh Evening Courant – The International Exhibition, London – Honourable mention – W.Wilson, Glasgow for a dry lay brick making machine. (Grace’s Guide confirms this is William Wilson, Campbellefield – catalogue). 1862 – 1863 – William Wilson & Son, patent brick and tile makers, builders, and potters ; works, Campbellfield, 740 Gallowgate, and Muirhouses, 354 Eglinton street; office, Campbellfield. 22/10/1869 – Glasgow Herald – Campbellfield Pottery to be sold or let. The clay, being exhausted, this Work will now be converted to suit a tenant. There is a 15hp engine and boiler, gearing etc on the ground. Apply to Robert Leiper at the Work or William Wilson, 51 Buchannan Street. 1869 – 1870 – William Wilson & Son, patent brick and tile maker, builders, potters. Works Campbellfield, 678 Gallowgate, Muirhouses and 354 Eglinton Street. Office Muirhouses. (page 376). 1871 – 1872 – William Wilson, salt glaze, chemical and stoneware manufacturer, Campbellfield Pottery. House 1 Albert Road, Dowanhill (page 390). 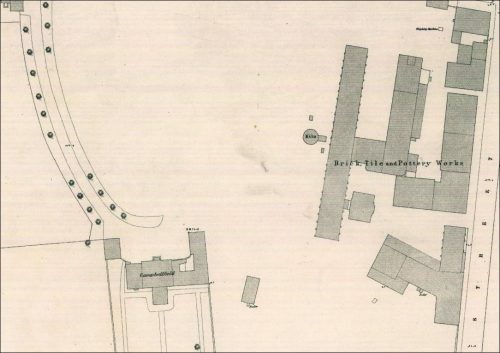 15/03/1880 – Dundee Advertiser – New Prison for Glasgow – We understand that the Prison Board of Scotland have just acquired the site for the new prison which is to supersede the old and proverbially and familiar ‘Duke Street’. About 32 acres of the lands of Balinnine adjoining the village of Riddrie and 200 yards south of the Cumberland Road have been purchased from th eproprietor Mr Wilson of Campbellfield for the purpose of erecting thereon the vast penal establishment rendered necessary by the increasing number of our criminals and the restricted accommodation of the present Bridewell. Operations are forthwith to be commenced. Information on archaeological dig at the site in 2007 – see page 101 – Campbellfield Brick and Tile Works, David Street,Gallowgate. History – Campbellfield House, Gallowgate, Glasgow. The last of this class which we shall notice is the dry-clay machine of Wilson, of Campbellfield Brickworks, Glasgow, which was exhibited in action at the Exhibition of 1862.
is so regulated that the destruction of the machine is guarded against. Staff from AOC Archaeology Group have uncovered remains associated with the Campbellfield Pottery during fieldwork in Glasgow’s East End. Evaluation trenches excavated at the site at David Street revealed what may be the base of one of the kilns. This work was undertaken as a condition of planning consent on the advice of the West of Scotland Archaeology Service. The Campbellfield pottery was operated at this site by William Wilson (1827-1849), a partnership (1849-1856), William Wilson Jnr. (1856-1874), and William Rankine Currie (1874-1881). Its various buildings and structures were depicted on the 1st edition Ordnance Survey map of 1861, an extract from which appears at the top of this article. On this map, it is possible to identify a round structure standing separate from the other buildings, possibly representing a kiln. The Campbellfield Pottery Co. Ltd. moved production to a site in Springburn in the 1880s, and ceased production in 1901. The site of the pottery was extensively landscaped during the 1970s, but it was felt that solidly constructed structures such as kilns could have survived this process, and this proved to be the case. 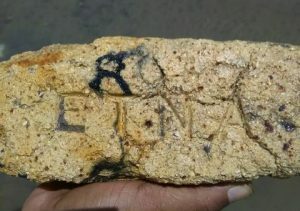 Evidence of kiln furniture, plus a number of wares marked with the Campbellfield stamp, has also been recovered from the site. Next Article Ward Mill Brick & Tile Works, Arbroath, Angus. Found by Michael Fallone in the Glasgow area. 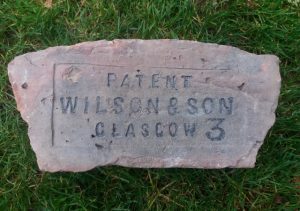 William Wilson & Son, Brick maker and builder, Eglinton Street and Pollokshaw Road, Glasgow. This is a circle brick and the 5 will reference the angle of curve on the brick ( and therefore how many will make up a circle – chimney stalk ) . …. Found by Michael Fallone in the Glasgow area. This is a curved or circle brick and the 7 will denote the degree of curve or angle. 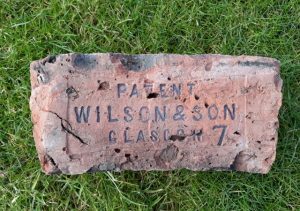 William Wilson & Son, Brick maker and builder, Eglinton Street and Pollokshaw Road, Glasgow. . . .
Found at Auchenheath, Lanarkshire. 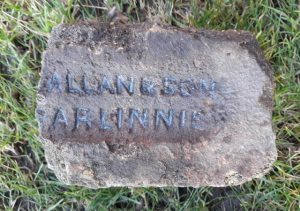 John Allan & Son – Fire Clay Manufacturer, Barlinnie Fire Clay Works, Cumbernauld Road, Glasgow. . . . .
Found by Robert Bain from West Dunbartonshire. Find location unknown. 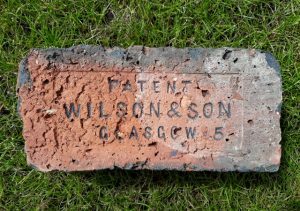 William Wilson & Son, Brick maker and builder, Eglinton Street and Pollokshaw Road, Glasgow. This is a circle brick and the 3 will reference the angle of curve on the brick ( and therefore how many will make up a circle – chimney stalk) ….